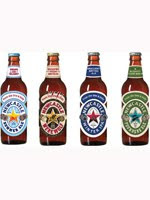 Newcastle Brown Ale, brewer of the legendary “One & Only,” today announced the debut of four distinct Newcastle Limited Edition brews, which will be available for a limited time at select neighborhood pubs or stores throughout 2011. This Limited Edition offering represents the collaboration of two great bastions of British brewing, Newcastle Breweries in England and Caledonian Brewery in Scotland. Built in 1869, Caledonian Brewery today operates as a fully functioning brewery museum, using rare direct-fired open coppers to brew all ales. The combination of Scottish brewing authenticity and creativity, partnered with the drinkability you expect from a Newcastle, results in a series of custom Limited Edition ales that can’t help but taste great. For those yearning for the return of summer’s sunny blue skies and relaxing moments, Newcastle Summer Ale arrives just in time to toast the warmer days. Since 2009, Newcastle Summer Ale’s bold, crisp and refreshing taste has offered the perfect complement to summer gatherings with friends and family. The Newcastle Limited Edition brews will be available nationwide in 6-pack and 12-pack bottles, as well as draught. Watch for reviews of the Winter IPA and Werewolf coming this week and next!